It has been two months since Gov. Andrew Cuomo announced that Bart Schwartz would conduct an “independent review” of the state’s signature Buffalo Billion economic development program and yet Schwartz’s contract with the state remains either unfinished or under wraps. On April 29, following the news that U.S. Attorney Preet Bharara had subpoenaed some of Cuomo’s closest allies in conjunction with an investigation into bid-rigging and other possible improprieties, Cuomo and Schwartz released a joint statement announcing that the former U.S. attorney was being hired. Cuomo administration officials have repeatedly failed to respond to Gotham Gazette inquiries about the status of Schwartz’s contract since he was appointed. On May 24, Cuomo told reporters that the contract had yet been finalized, but that he would make it public when it was. Without seeing Schwartz’s contract it is impossible to know exactly what he has been tasked to review; the terms of his investigation; who he reports to; and how much Schwartz’s services are costing taxpayers. Schwartz’s contract must legally be made public if it involves the use of taxpayer money. 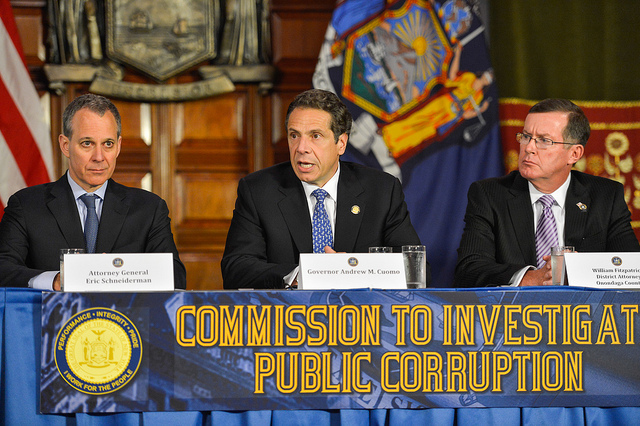 Watchdog groups note that Schwartz’s role could have been filled by numerous other existing state entities that investigate corruption, including Comptroller Tom DiNapoli, whose office oversees state finances and contracting. On Tuesday evening, The Times Union reported that Cuomo has empowered Schwartz under the Moreland Act, giving him "the power to issue civil subpoenas," which the Cuomo administration confirmed, though it still declined to make any documentation public. A Cuomo spokesperson told The Times Union that Schwartz's contract was still being finalized and that when it is done, it will be submitted to DiNapoli and made public. In a statement to The Times Union, a Cuomo spokesperson said of Schwartz's review of the state economic development programs and development of new guidelines for fund disbersement, "Both processes are ongoing and, as the guidelines are being drafted, Mr. Schwartz has closely examined and signed off on payments before they were released. This is important work and we thank him for promptly commencing his review. It is also a complex and unique assignment and we expect the contract to be finalized and sent to the (state) comptroller shortly." 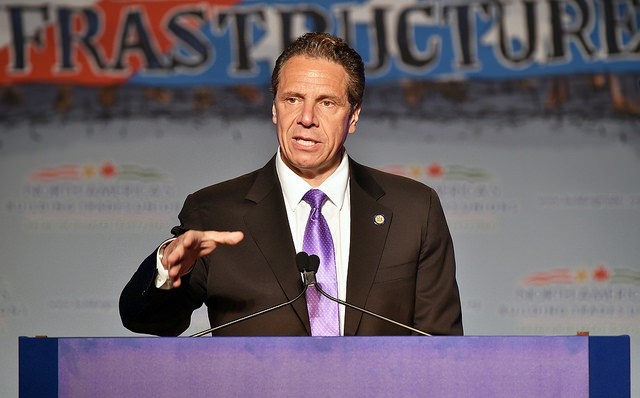 Anonymous Cuomo administration officials have been referenced in various publications saying that Schwartz is reviewing and approving all contracts and cash flow related to the Buffalo Billion and other economic development projects. For the second time this year, payments to the SolarCity project were recently made late and led to talk of possible layoffs and disruption of the project. 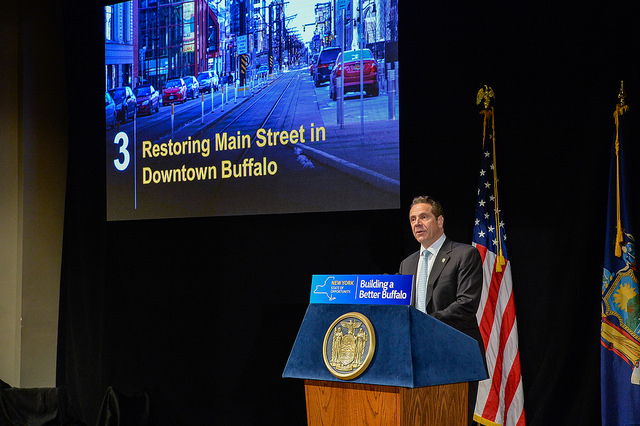 An anonymous Cuomo administration official told The Buffalo News that Schwartz approved the cash for the project and that it was delayed during a review by DiNapoli. The comptroller’s office later denied it had anything to do with the delay. The firm handling Bart Schwartz’s public relations declined to comment on the status of his contract, but pointed to Schwartz’s statement from April. “The state has reason to believe that in certain programs and regulatory approvals they may have been defrauded by improper bidding and failures to disclose potential conflicts of interest by lobbyists and former state employees,” Schwartz wrote, in apparent reference to Cuomo associates Joseph Percoco and Todd Howe. When asked on May 24 if Schwartz’s findings would be made public, Cuomo said that decision would be up to Schwartz, but Cuomo’s press office later clarified the report would be made public as long as the U.S. attorney’s office approved. Note: this article has been updated with new information as reported by The Times Union.